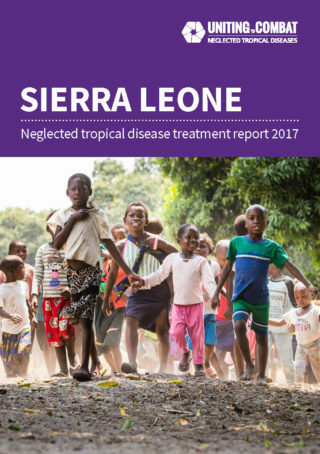 This country profile provides an overview of Sierra Leone’s progress in reaching those in need of mass NTD treatment based on 2017 data. Sierra Leone has a well implemented and consistent preventive chemotherapy programme for all four endemic diseases. It is encouraged to continue working to maintain annual high coverage implementation of all components, in all risk groups. Treatment coverage increased from 78% in 2016 to 81% in 2017. Sierra Leone does not require mass treatment for trachoma. Treatment coverage decreased from 98% in 2016 to 83% in 2017. Treatment coverage increased from 71% in 2016 to 99% in 2017. Treatment coverage decreased from 79% in 2016 to 78% in 2017. The ESPEN portal (a World Health Organization AFRO region project) provides maps and district-level data for the preventive chemotherapy diseases in Sierra Leone.